Price: £1.59 (incl VAT) Sorry, this item is currently unavailable. Click here to receive notification when this product comes back into stock. 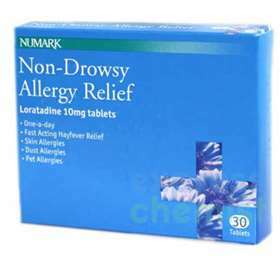 Numark Non-Drowsy Allergy Relief Tablets - Loratadine 10mg tablets. To relieve the symptoms of hayfever and other allergies e.g. pet or house dust mite allergies. Can also be taken for skin allergies. Can also be taken for skin allergies such as rash, itching and hives. Directions for Use: Adults and children over 2 years and weighing over 30kg - Swallow one tablet a day with water. Ingredients: LORATADINE, LACTOSE MONOHYDRATE, MAIZE STARCH, PREGELATINISED STARCH AND MAGNESIUM STEARATE. Warnings: DO NOT GIVE TO CHILDREN UNDER THE AGE OF 2 OR UNDER THE WEIGHT OF 30KG. DO NOT USE IF YOU ARE PREGNANT OR BREAST-FEEDING. IF SYMPTOMS PERSIST PLEASE CONTACT YOUR GP. Product code: 1102516 Price: £1.59 (incl VAT) Sorry, this item is currently unavailable. Click here to receive notification when this product comes back into stock.